The next OMD album, came in fast on the heels of their earlier Hughes Film top five smash, but as with Hughes’ earlier dalliance with Simple Minds, the big hit single was saved for the all-important soundtrack album. It would not be on the artists’ next original album of material. In a turn of events that showed how OMD’s status had changed in America, the new album was purchased on domestic CD. To date, every OMD CD in my collection for the albums prior to this, had been purchased as costly imports. “The Pacific Age” was an album of theirs where I can’t say I’ve ever seen an import pressing of any kind. The album opened with the overly busy and fussy would-be single “Stay [The Black Rose + The Universal Wheel].” OMD were convinced that this one was single material but Virgin had other, more dangerous ideas. The frantic, busy arrangement sounded like a case of “too many cooks” syndrome. Worse, the song itself was no great shakes, and the end result smacked of the sort of desperation that was OMD’s stock-in-trade during their frantic “break America” phase. McCluskey has said that the first ten song written were the album. End of discussion. There was no time for any careful and considered writing phase. They were grinding it out like sausage by this point, as if the now slick female backing vocals added to the end result said anything less. Fortunately, the next song was one of the best on offer here. “[Forever] Live + Die” had been the lead-off pre-release single and echoing “Souvenir,” it was a Paul Humphreys lead vocal. Humphreys had co-written the track with the Weir brothers and it contained enough of the shimmery evanescence that had made “Souvenir” such a beguiling proposition. It’s not quite as otherworldly or sumptuous, but it’s trying, and next to OMD’s recent efforts, succeeding reasonably. The downside here were the horn charts in the middle eight [which sounded like samplers]. They were a little rote but not enough to seriously damage the fine song. The market also thought so with the single doing brisk top ten to top twenty business all over the world; including a number 19 placement in America, making it their second best selling single here. 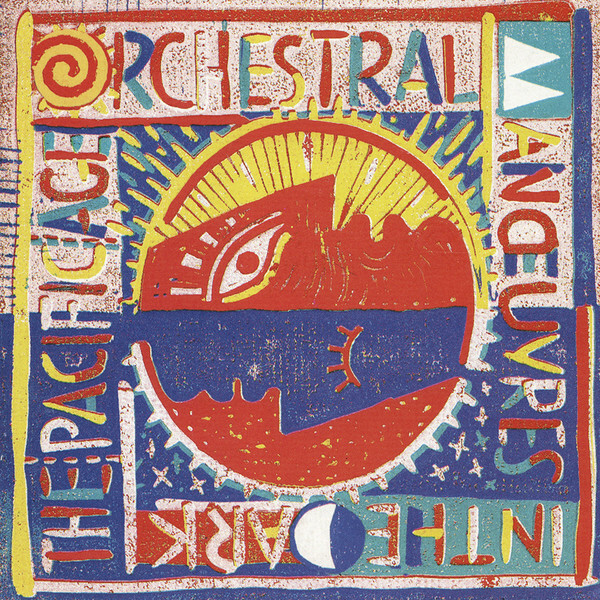 After that high point, the levels of accomplishment stayed high with the title track to “The Pacific Age.” The stately, portentous arrangement of sampled strings walked through the door that “The Native Daughters Of The Golden West” had opened and made it truly something that reflected OMD. Only these guys would have written a song about the balance of world financial power shifting to Asia. There’s a strong Ennio Morricone vibe to it all which feels right with the band. I was shocked upon hearing “The Dead Girls” in 1986. It was the first time that OMD had deliberately made a self-pastiche and in 1986, that smacked of desperation. It was nothing more than the whole of “Architecture + Morality” thrown into a blender and re-constructed with samplers. It hits its marks and ticks all of the boxes. Chorus samples, Catholicism, military drums. Check. Check. Check. I do like the medieval quality to some of the synth lines that sound like something out of the 16th century. Not the worst OMD song I’d heard lately, but it all seemed too facile in the face of it. Had the band been in a healthy place, this would never have passed muster as an album track. But I did not know how good I had it, because the next track was by far the worst OMD single released at that point. Virgin had balked at “Stay” as single material; preferring one of the worst, most MOR tracks OMD had cut. “Shame” [an apt title] was right down there with “Hold You” for being the biggest sell-out material the band had ever committed to wax. One thing I can’t understand was how the third single from the album somehow never got a release in America. It sounded tailor made for the Adult Contemporary charts. I imagine that A+M maybe had better A+R taste than Virgin at that point in time. Which shown really, how far Virgin had fallen by 1986 in my esteem. I can point to before and after Culture Club being points of artistic inflection for the label! What really staggered the mind was that Virgin paid to have Rhett Davis [who produced “Dazzle Ships”] re-record the song specifically for the single with the band, and it still missed the UK top 50. All that time and money squandered on a song that I would have never allowed the band to record if I had been their A+R person. This entry was posted in Core Collection, Mid-80s Malaise, Rock GPA and tagged OMD, Stephen Hague, The Pacific Age. Bookmark the permalink. Totally agree with most of what you say (I love Stay and do think it should have been a single). 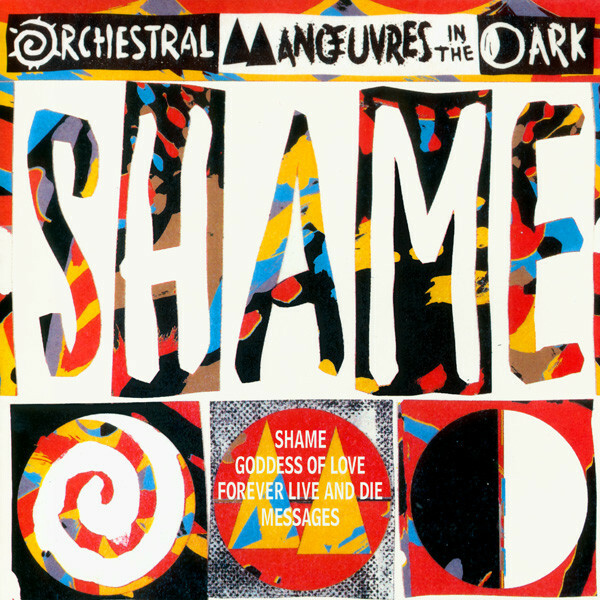 Interestingly Shame (which I also loathe) was actually written by Graham Weir (who also pretty much recorded all the music on both the album and single versions) as he said OMD’s music wasn’t soulful enough. Though as McCluskey said about the song ‘we all think it’s great but never wanted as a single. Also there were other tracks considered but not included on the album. Most famously This Town was due to be the second track on side 2 but after Flame Of Hope was written for the b side to Forever they decided it was better so they swapped them over. Other tracks written and demoed which weren’t included were Heaven Is (again as it was also dropped from Junk Culture), Cajun Moon and Cut Me Down. McCluskey also wrote a song called Gun People about the USA but then dropped it as he wasn’t happy with the result. I have always liked Pacific Age, it has a more OMD sound than Crush and was a 100% improvement on the previous album plus it had some great tracks. We Love You also deserved to be a hit but was maybe too obtuse for the record buying public, plus I don’t remember it getting any airplay in the U.K.
Richard Anvil – I agree it’s better than “Crush,” hence the half point lead on my rating. “Flame Of Hope” certainly deserved better than a B-side fate, while “This Town” being a weirdly atypical blues number, had B-side written all over it. So it all worked out for the best, I think. 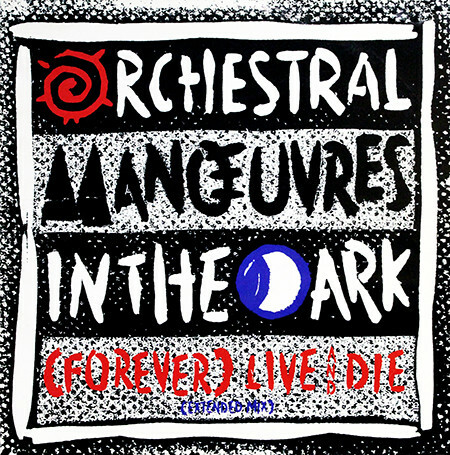 There is a lot to like about Forever Live + Die. It is a crafty song, playing off an almost carnival music motif. I could do without the Heaven 17 aping funky guitar licks and those horns are a bit embarrassing to this fan – send them back to Paul Young or Phil Collins, or wherever they came from. But the best thing is Paul Humphreys’ very confident vocals. He commands the song with his quiet energy. Much of what is good about OMD can be found in the title track. But there is something that always grates on me – Andy’s pompous, self impressed vocal attack. We’ve discussed his growing “forced emotion in relation to the previous couple albums, but here it just turns me off. The vocal doubling is also just too much for me in the chorus. Shame – I just hit skip on the cd player. Echorich – Vocally, OMD were not powerhouses to put it mildly. Mid-period OMD is full of the crutch of Andy doubling. Yeah it was a Bowie technique, particularly when they split the octaves, but overused. Still, word has it that they tripled Paul’s lead on “Souvenir!” By “(Forever) Live + Die” he sounded much more confident, as you noted. Actually you are also completely spot on about ‘Dead Girls’. In their biography McClusky says the following about the track ‘we were consciously trying to do something similar to Architecture and Morality and to see how we’d changed. I think it was a test piece like “OK let’s do something with some of the styles we used on A & M, like the drum styles and the choirs, but it’s got to be different”. Apparently Paul played the drums and Mal Holmes was so horrified at how bad they were he demanded a disclaimer that it wasn’t him! Richard Anvil – Well, it was A+M but with cheesy samplers. The quality of their digital synthesis can only get so good, but never really reaches the early heights to my ears. Those first three albums [but particularly albums two and three] have a sound that I’ve been missing for decades with this band. That was why I was over the moon when John Foxx + The Maths remixed the “Dresden” single. OMD had not sounded so wonderful since 1981 to me. I think the band are too lazy to put that kind of effort into their sound design like they did before digital synthesizers. I consider that a pity. Live, I get it, all of the samples loaded into the Roland Phantom’s are acceptable in that context. I would not make anyone play analog synths live that they had to manually patch between songs and hope they stayed in tune. Especially when hopping all over the world with wildly variant power grid quality. Though I would pay extra should a band want to do this! It’s quite good! The only drawback is that the budget did not allow for any performances of full songs, but having a documentary filmmaker who is passionate about OMD made it really good.